To meet the growing and changing needs of customers, Sify Technologies announced that Sify.com will enable local payment methods. By this move, users’ experience will get simplified while purchasing Skype credit or subscriptions to make calls to mobile and landline numbers outside India. This partnership will help Indian consumers access Skype’s some of the most competitive calling rates while calling abroad from India and customers can take these offerings from Skype more easily. “Sify is making it easier for Indian Skype users to collaborate with almost 7 billion mobile and landline users across the world,” said Kamal Nath, Chief Executive Officer, Sify Technologies. “India is a key market for Skype and we want to help our users in India connect with friends and family abroad,” said Judd Harcombe, Head of Emerging Market Business Development at Skype. 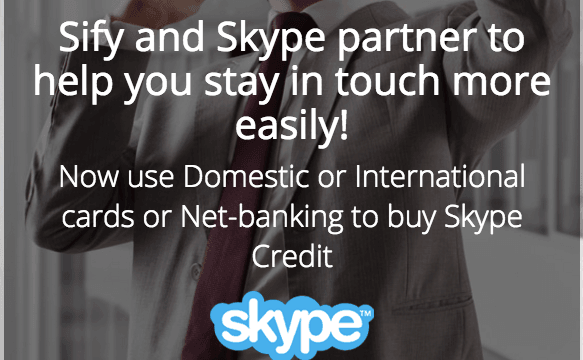 Skype users can now also buy their credit or subscriptions from www.sify.com/skype using Indian debit/credit cards and net banking. With a best voice quality , its awesome.